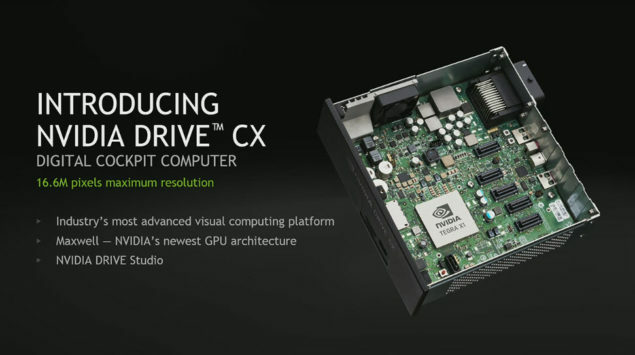 One of the biggest changes in the industry have just arrived with the Tegra X1; and the Drive CX will be the first product to feature this SoC. Ladies and gentlemen 20nm has landed and Maxwell architecture is the first GPU to be fabbed on this process. This is great news because the Tegra X1 employs desktop class GPU architecture and that means 20nm is ready for high performance ASIC production at TSMC. Moving on the actual part in question, the Drive CX module is basically a cockpit computer designed for the automotive industry. The job of tis particular chip will be to power the HUD and the dashboard of a car, and this involves intensive material rendering among other things. This module will be powered with the Tegra X1 and will be combined with the Drive PX module for an impressive total of three Tegra X1 per car. That is a complete total of approximately 3.5 TeraFlops of FP16 compute. The NVIDIA DRIVE CX cockpit computer is capable of driving a total of 16.8 megapixels of display resolution,and capable of rendering advanced graphics to up to three displays (currently). The system delivers the graphics performance required for 3D navigation rendering with realistic lighting effects, beautiful rendering of digital clusters,realistic rendering and compositing of a surround view based on multiple camera inputs,and enhancing video feeds from cameras to compensate for environmental conditions. The system also comes with a complete road tested software stack with software modules for features such as Photo-real Graphics, Surround Vision rendering, Advanced Navigation and more. The DRIVE CX hardware and software stack can be easily integrated into car designs, significantly accelerating a carmaker’s or Tier 1 supplier’s time to market and reducing software development costs. Basically, the difference the Tegra X1 will make with the Drive CX module is luxury. With so much processing power at your disposal, car manufacturers will be able to incorporate highly advanced textures simultaneously, giving a much more realistic looking dashboard. Not only that but it will allow a very wide variety of materials to be simulated, along with lighting effects on the same. Here is another example of the options that the Drive CX module will enable. Remember those futuristic navigation displays form science fiction movies? Well, that is exactly what the Drive CX aims to achieve. Current navigation systems are mostly 2D based and have too much information and clutter on screen. With 3D rendering you could selectively dim out the surrounding area without compromising on navigational ability. 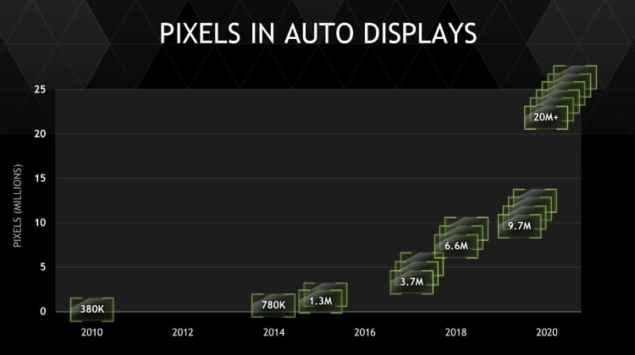 In conclusion, you are looking at approximately 4 to 6 displays scattered throughout a car rendering materials on screen. The result would be a massive reduction in cost (versus what it would take to have these materials and functions built physically) and could result in Nvidia getting some significant design wins.